The State Route 91 (SR-91) Corridor Improvement Project (CIP) is a lane(s) addition project that spans approximately 12 miles along SR-91 and portions of Interstate 15 within Orange and Riverside Counties. Two build alternatives with a total of 12 design variations have been analyzed. The potential exists for a four-lane widening of SR-91 that would require the acquisition of between 70 and 300 properties. Due to the magnitude of the project acquisitions, a tool was needed to help convey these data. LSA’s GIS department developed an application to aid the public in understanding not only if the project would directly affect them, but how and why. Using the platform of ArcGIS Explorer, this application integrates engineering data, parcel data, and ownership information, spatially aligns the data on top of an aerial base, and allows the user to query that data. Widgets were designed to allow the user to zoom to a specific address, identify individual parcels, determine how their property will be impacted, view the various alternative designs one by one, and determine whether their property will need to be acquired. 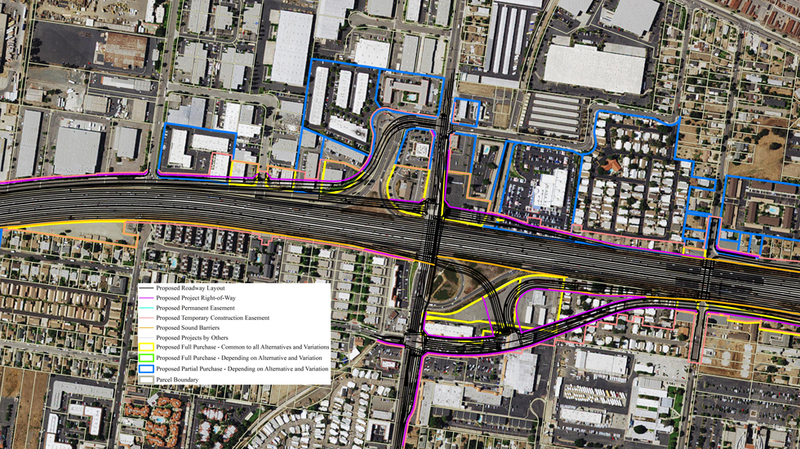 This Parcel Viewer application was very successful when it was introduced at a public hearing for the SR-91 CIP. The application provided the public a very detailed and hands-on approach to learning how they would be affected by this major transportation project occurring in their backyard.